When it comes to watching videos, I feel as if there are 2 ways I actually “watch” videos: 1) I give the video my undivided attention and watch it the whole time; or 2) I have the video running as background noise as I surf the internet. As I didn’t know if I should include one way of watching over the other, I decided to just include both ways of watching videos in my data collection. I also divided up the types of videos watched in order to see what types of videos I devote more time in watching. 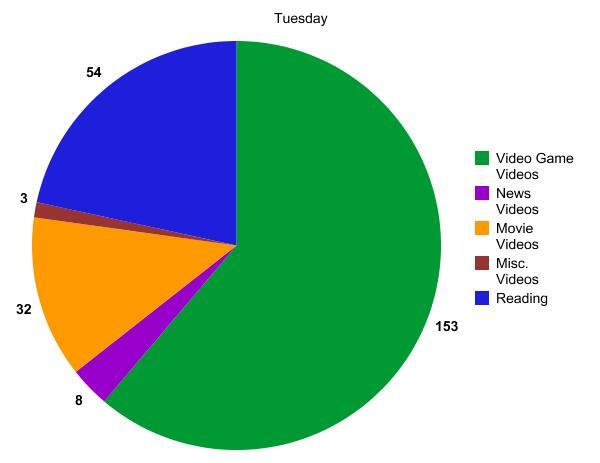 What follows is a brief description for the types of videos shown in the charts. Video Game Videos: Videos that involve video games, such as reviews of video games, Top 10 lists, and Let’s Play videos. Movie Videos: The videos that fall under this category are reviews of movies and movie clips I find online. Educational Videos: Videos where the content is teaching me something in some way. News Videos: Videos that talk about current events going on in the world today. Misc. Videos: These are videos that I couldn’t really put under any other categories. These videos range from vlogs to random cartoons. When it comes to the reading, there are two types of books I read throughout the week. For the first two days, I read a Young Adult Fiction titled WARP by Eoin Colfer. The rest of the week was spent reading an Urban Fantasy book titled Divine Misfortune by A. Lee Martinez. Without further ado, here are the charts! I will use the above chart to give an example of how I “read” the charts for this project. 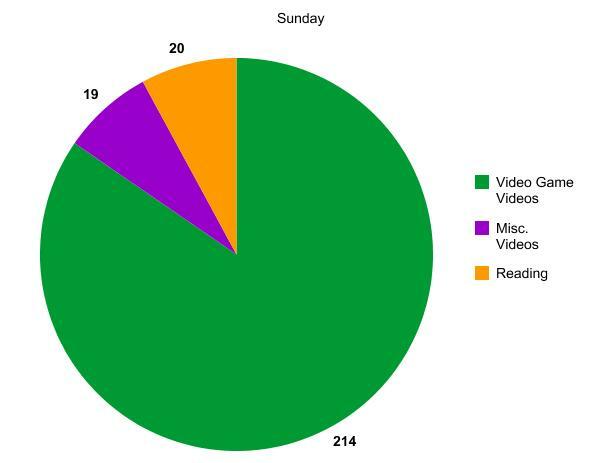 As you can see, I spent a grand total of 253 minutes either watching videos or reading in my spare time on Sunday. I spent 214 minutes watching Video Game related videos, 19 minutes watching miscellaneous videos, and 20 minutes reading. You can use this as an example in reading the rest of the charts. Please note that the colors for each category in each chart are often unique to that chart alone. 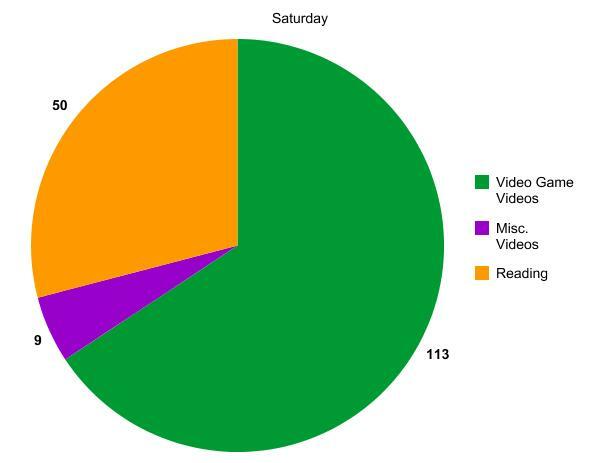 It’s no surprise to see that I spent far more of my free time watching videos than I did reading. I spend far more of my free time online than off. 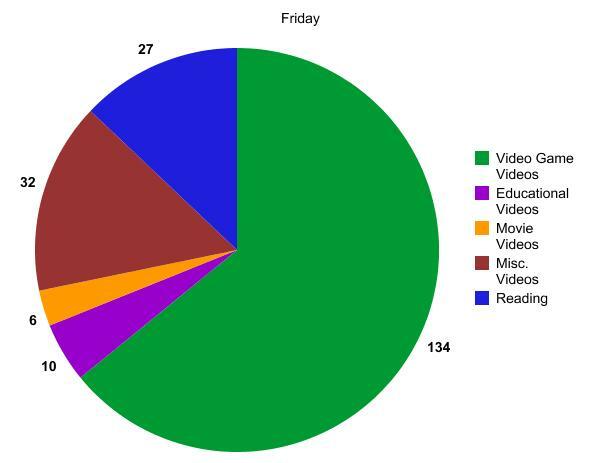 Still, it was interesting to find how much time I spent specifically each day watching videos or reading. 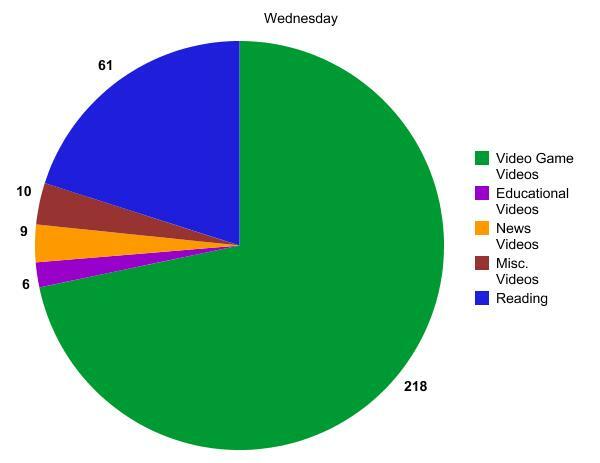 By my calculations, I spent an average of about 4 hours a day reading or watching videos. 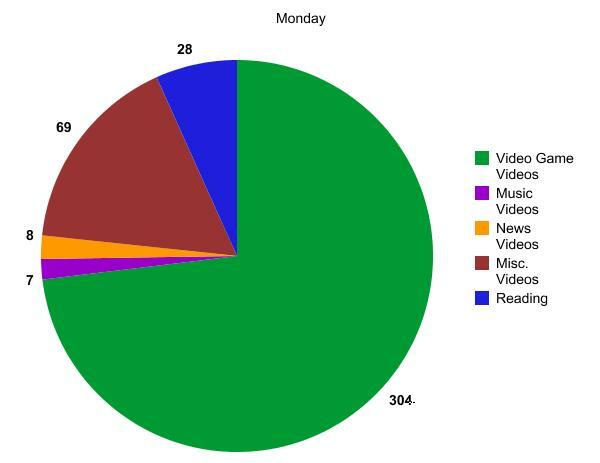 The odd one out from this trend is Monday, when I spent about 7 and a half hours watching videos or reading. I think the answer to my question is clear: I watch a lot of videos in my abundant amounts of spare time. This entry was posted in Class Projects by richard0211. Bookmark the permalink.